As a child, I always remember getting very excited about all the seasonal cartoons. It was like I waited all year just for that time, it always put me in a holiday mood. So, I can't even tell you how thrilled I was to get a review copy of Mickey Mouse: Merry & Scary to enjoy with my children. This Holiday Collection this in the classic style of Disney that we all enjoy with lots of giggles and grins. My family highly recommends it and thinks it should be a part of everyone's video collection. After all, know you can watch it anytime you want not just around the holidays. Invite Mickey and Donald into your home as they bring laughs and merriment to not one, but two holiday seasons! 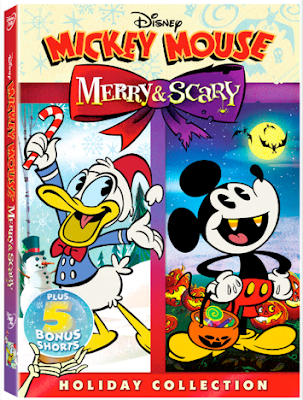 Mickey Mouse: Merry & Scary is arriving on Disney DVD September 26th, and you’ll want to catch their Halloween and Christmas hijinks! Get into the Halloween spirit as Mickey, Donald, and Goofy swap hair-raising Halloween stories. Then fast forward a couple months to Donald’s first Christmas festivities with friends! These new cartoons and bonus shorts from Disney animation are sure to be instant classics with your family! Don’t miss out on Mickey Mouse: Merry & Scary, a perfect collection to share through the holidays! Synopsis: The Scariest Story Ever: A Mickey Mouse Halloween Spooktacular! For Halloween, Mickey has tricked out his house like a “tomb, sweet, tomb" and along with his pals Donald and Goofy, plans to tell hair-raising Halloween stories! However, his attempt at being scary falls flatter than a pancake. Can Mickey conjure up a truly terrifying tale before the stroke of midnight? It’s the most wonderful time of the year…to migrate south for the winter! But Donald wants to stay put and celebrate his first Christmas with his friends. Mickey creates the ultimate list of everything to make Donald's first Christmas great, but before you can catch a snowflake on your tongue, Donald has turned into a shivering, sneezing duck-cicle! I so enjoy watching these, I remember watching them when my children where little .